What was the biggest cobalt news in 2018? Our most popular stories show that investors are keen to stay on top of supply/demand developments. 2018 brought less excitement in the cobalt space than the previous year, but interest from investors remained strong, with optimism about electric vehicles (EVs) still riding high. With carmakers promising to produce an increasing number of EVs, many of our top cobalt news stories of the year focused on exactly how much of the metal they will need. Supply concerns and disruptions were also in focus, with market watchers keen to stay on top of the latest developments. Read on to see what cobalt news stories grabbed the attention of our investor audience in 2018. Musk made the statement in a May conference call, sparking concerns about future demand for the metal, which is a key component of the lithium-ion batteries that power EVs. Despite Musk’s assertion, many market watchers remain confident in cobalt demand, with some saying the sheer number of EVs hitting the road will make up for any changes in battery chemistry. 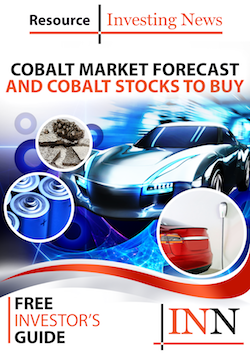 Our next most popular cobalt news story of the year is an interview with Anthony Milewski, CEO of Cobalt 27 Capital (TSXV:KBLT). Speaking at the Lithium Supply and Markets conference, he emphasized that supply is a key issue in the cobalt space — although not for the reason investors might think. “The key risk from my perspective is not price, it’s not ‘is there enough cobalt?’ Instead, it’s just simply risk associated with concentration and concentration in a difficult place — namely the Democratic Republic of Congo (DRC),” he explained. The DRC is the world’s top producer of cobalt by far, but production there has been linked to human rights abuses and child labor. The country also recently declared cobalt a strategic metal, nearly tripling the royalty rate miners pay to 10 percent. “I think that the industry is going to have to develop a solution for monitoring cobalt all the way back to really the first shovel of dirt,” said Milewski. The steep April share price drop of Glencore’s (LSE:GLEN) Katanga Mining (TSX:KAT) also made cobalt headlines this year. The decline was driven by the news that Gecamines, a state-owned DRC company, had taken steps to dissolve Kamoto Copper Company, which is 75-percent owned by Katanga. Gecamines pointed to an ongoing capital shortfall worth billions as the reason for the move. While the situation continued for several months, it has since been resolved. Katanga and Gecamines entered into a settlement agreement in mid-June and agreed to a recapitalization plan that “will allow the reconstruction of the net equity of [Kamoto].” They announced at the end of that month that the transactions contemplated in the agreement had been completed. Unfortunately, that was not the end of Kamoto’s issues in 2018. In November, Katanga suspended cobalt sales from Kamoto due to the presence of uranium in “levels that exceed the acceptable limit allowed for export.” Sales remain suspended, although Gecamines has voiced opposition. Mining giant BHP (ASX:BHP,NYSE:BHP,LSE:BHP) announced plans to jump on the cobalt train in April, with a company executive saying that it is looking to produce higher quantities of the metal as part of its plan to become a global supplier of battery materials. “Part of our transition to becoming a global supplier of battery materials means we have started looking at cobalt options as well,” Eduard Haegel, president of BHP’s Nickel West refinery, said at a battery materials conference in Shanghai. The company’s Nickel West asset currently produces some cobalt, and Haegel said the company could grow its output by developing a cobalt circuit at its Kwinana nickel refinery and by increasing cobalt recoveries at its Kalgoorlie smelter. Our final top cobalt news story of the year is an interview with Rob Fuhrman, senior investment analyst at Katusa Research. Speaking at the International Mining Investment Conference, he shared his thoughts on what investors can expect from the battery metals sector in the short and long term. What were your top cobalt news stories this year? Let us know in the comments section.